What a cold day we are having! This was the perfect opportunity for me to cook something warm and hearty for the family. 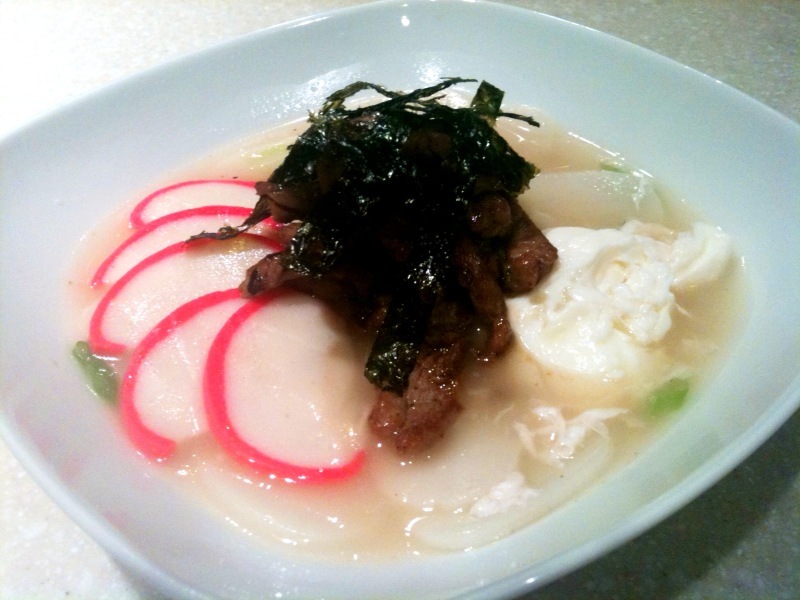 Hubby is a lover of Korean food, and I found the rice cake soup recipe a couple of weeks ago, have been meaning to give it a try. With a few tweaks, the result was SOOOO Goood! Also the prep time was super fast, this is something that’s definitely making into my regular meal rotation! 1 Soak the rice cake in cold water for 30 minutes. 2 Marinate the meat in the soy sauce, sesame oil, pepper, sugar, and minced garlic. 3 Saute the meat in a skillet, then set aside. 4 Heat up the chicken stock, bring to a boil, then reduce to a simmer for 5 minutes. 5 Add the rice cakes to the broth. 6 Bring to a boil, then reduce the heat to medium. 7 Cook for around 5 minutes, until tender. 8 Add the green onions. 9 Break the egg and dump into broth, don’t disturb it, once it starts solidifying, break the other egg and repeat. 10 Let it set in the hot broth, for at least 2-3 minutes, then add the Japanese fish cake slices, heat thoroughly (around 1-2 minutes). 12 Garnish each bowl with some beef and some crumbled kim.